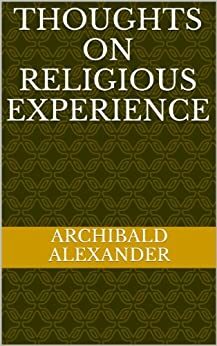 Thoughts On Religious Experience by Archibald Alexander. Archibald Alexander (1771-1851) was raised in a godly home and educated at Liberty Hall Academy. Converted in 1789, he was ordained as a minister in the Presbyterian Church. He served as an itinerant missionary, President of Hampden-Sydney College, and minister of churches in Virginia and Philadelphia, before becoming the first professor of Theology at Princeton Theological Seminary in 1812. He remained at Princeton until his death, where he earned a reputation as an outstanding educator and became renowned for his understanding of the nature and effects of biblical piety. 5.0 out of 5 starsIf only this was required reading! 1.0 out of 5 starsVery poor printing without page numbers. This edition, by Fist Rate Publishers, is very poorly produced. There is no title on the spine, no table of contents, no date of original publication, and for crying out loud, there aren't even page numbers. Page numbers! The typesetting is strange, and the font is difficult to read. I needed this text in a pinch for a class, and so the price was right. But page numbers! This book isn't worth the 7 or so dollars I paid for it. I would have been better reading it online somewhere. A.A. was certainly living in a different atmosphere/culture/world than we are living in today. For example, there appears to have been a lot more and a lot more serious "melancholy" among people and among Christians. The gloom at times is pervasive. 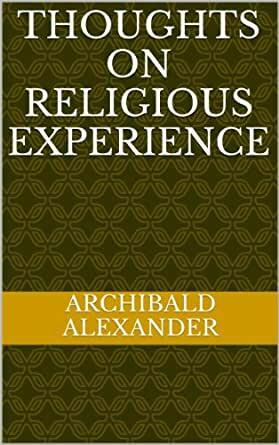 But while the author plumbs the depths in analysis, he also illuminates the Christian life and walk in an in-depth way that brings to light a number of truths not recognized or understood in today's world which are very helpful. The heights to which he takes the reader are worth the gloomy depths into which he sometimes descends. Strangely there are no page numbers in this reprint. I am not sure why since adding pagination to a scanned/OCR text would seem to be easy enough.